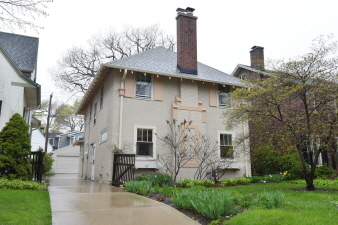 Wonderful Arts and Crafts two story Colonial on a desirable Shorewood street. Large living room has natural fireplace. Hardwood floors throughout home. Formal dining room off of cozy living room. Kitchen as generous storage space. Sliding doors off family room lead to patio. Half bath on the main floor. Large master bedroom features private dressing room that's connected to the full upstairs bath. Truly a must see!